A young Dalston resident says he is considering taking up law after helping lead the legal fight against the government’s efforts to trigger the official process of leaving the European Union without a vote in Parliament. 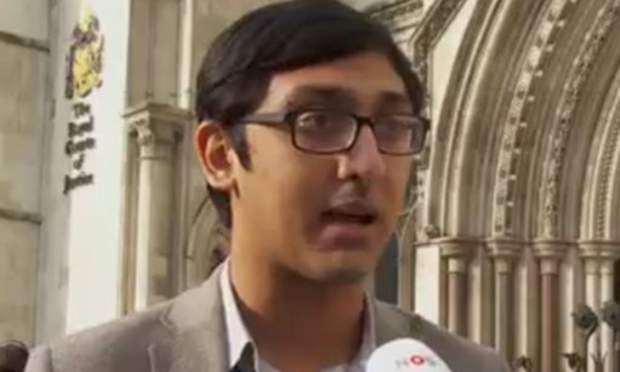 Tahmid Chowdhury, who is aged just 22, was an interested party in R v The Secretary of State for Exiting the EU, which was heard at the Royal Courts of Justice earlier this year. Chowdhury, who grew up on a council estate in Dalston and still lives locally, hopes to sit through at least half of the complicated four-day appeal hearing at the Supreme Court next month, when a panel comprised of some of the UK’s finest legal brains will have the final say on the matter. At stake is whether the government can use ancient powers known as the Royal Prerogative to trigger Article 50 and take the UK out of the transnational bloc without Parliament’s blessing. Chowdhury told the Hackney Citizen that though he voted Remain he respected the wishes of the majority of voters and believes Brexit must now go ahead. For his own part, he said he favours a soft form of Brexit whereby Britain would retain access to the single market, possibly in return for less-than-complete control over freedom of movement. There are no Leave voters among the claimants or interested parties in the legal bid – but Chowdhury insisted some Leavers had been among those who donated to a £300,000 fighting fund. Gina Miller, the lead claimant, has been the Brexit case’s most prominent backer and has reportedly been subjected to abuse online. But he said such behaviour “just makes us even more passionate to win and deliver on the belief of all the people that are supporting us”. Not all youngsters from London are such passionate Europhiles, however. It aims to allow residents of the capital share their personal reasons for voting in this way and “represent the Leave vote in London in a positive light”. At the time, Harris said she objects to unelected European Commissioners and what she sees as “a harsh version of capitalism and globalisation…exacerbated by the EU”.